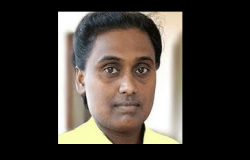 Sivasubramaniyam Sivagami alias Thamilini, the former leader of the political wing of the LTTE, was released Wednesday following a year of rehabilitation. The Commissioner General of Rehabilitation Brigadier Dharshana Hettiyarachchi said that she was handed over to her relatives at the Poonthottam Rehabilitation Centre in Vavuniya. Thamilini's mother and sister were present to receive her. Ex-LTTE member Thamilini, a resident of Kilionochchi was sent to the rehabilitation centre following a court order.